Custom black & white 58” arc vented economy umbrellas acts as a catalyst of success for marketers who wish to carve deep brand impressions on minds of their targeted customers. Equipped with features such as colorful shoulder strap sleeve, windefyer vented canopy, black & white nylon fabric – this promotional black & White 58” arc vented economy umbrella becomes a highly useful thing during a cracking stormy day. 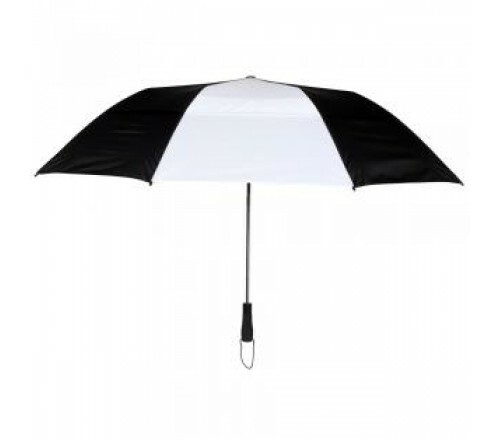 As, black and white are very common color choices for alternating, so personalized black & white 58” arc vented economy umbrellas can be sought by marketers from all niches and budget sizes. Dimensions - 58" arc - Closes to 22". Imprint area - 10"W x 6.5"H.